I’ll call this a direct sequel, and I couldn’t be more excited. Disney’s tween oriented channel Disney XD has been running animated Marvel adventure series for some time — we’ve occasionally talked about the various Avengers, Ultimate Spider-Man, and Guardians of the Galaxy shows. Some of us have even watched Hulk and the Agents of S.M.A.S.H. While these show have occasionally echoed elements of the Marvel Cinematic Universe, they haven’t been continuations, even when they’ve tried to cast sound-alike actors in key roles. But in 2017, we’ll get a series that really is both Marvel and Disney, picking up right where the movie left off: Big Hero 6. In my original review, I predicted — not a hard prediction to make — that there would be a 2D animated series, because there were obviously many more adventures to be had. Not only did Disney agree, but they got most of the film’s cast to return, according to Animation Magazine. 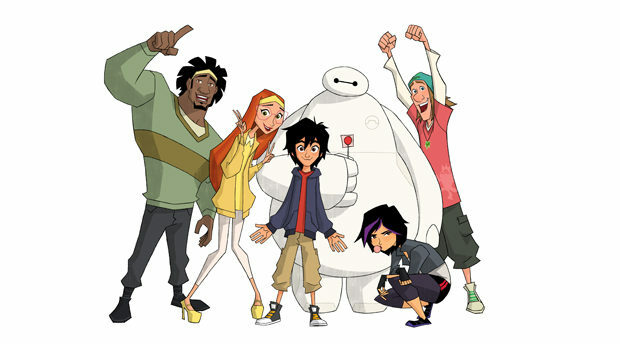 Ryan Potter will still be the precocious genius Hiro, joined by Jamie Chung reprising Go Go, Genesis Rodriguez as Honey Lemon, Maya Rudolph as Aunt Cass, and of course Scott Adsit as Baymax, really the heart of the team. Perhaps surprisingly, Alan Tudyk is on board as tech billionaire Alistair Krei. Whether he will be an ally or an enemy remains to be seen. Stan Lee will also be making “appearances” as Fred’s Dad, though T.J. Miller is not returning. Instead, Fred will be voiced by former Saturday Night Live player Brooks Whelan. Khary Payton, familiar to animation fans as Cyborg on Teen Titans GO!, will replace Damon Wayans, Jr. as Wasabi. It looks like their main antagonist will be a villain named Obake, and producers could not have chosen a better actor for him. Andrew Scott, best known to American audiences as Moriarty on Sherlock, will stand in opposition to our heroes, and his silky yet slimy tones already have me a little creeped out. Well played, Disney XD. At last year’s D23, Disney Interactive also suggested that Kingdom Hearts 3 would feature story elements that could be considered a direct sequel to Big Hero 6. That game is currently scheduled for release on December 30, 2016.